In many natural scenes, portions of occluding surfaces and contours can be camouflaged by having an identical color as their background. It is now well known that the visual system will often generate illusory contours and surfaces in order to fill-in this missing information. It is widely believed that the visual system does this in order to provide the best overall “explanation” of the images that form in our eyes. In this illusion, four circular disks are simply translated back and fourth over a thin square outline. Although all of the image data is fully “explained” by the visible disks, the visual system generates a strong and clearly visible additional illusory contour inside the square outline. This illusion cannot be understood with any known mechanism or theory that has been proposed to explain the formation of illusory contours. This quicktime movie is best viewed by downloading it and playing it in “loop” mode. You might have heard about my earlier demonstration in which people fail to notice a person in a gorilla suit when they are busy counting how many times a group of people pass a basketball (see www.theinvisiblegorilla.com). People can only experience the gorilla effect once-after they know to look for a gorilla, it is no longer unexpected. But what would happen if we tried showing you another video just like it? If you know that something unexpected might happen, and you actively look for unexpected events, does that make you more likely to notice them? Try it for yourself. 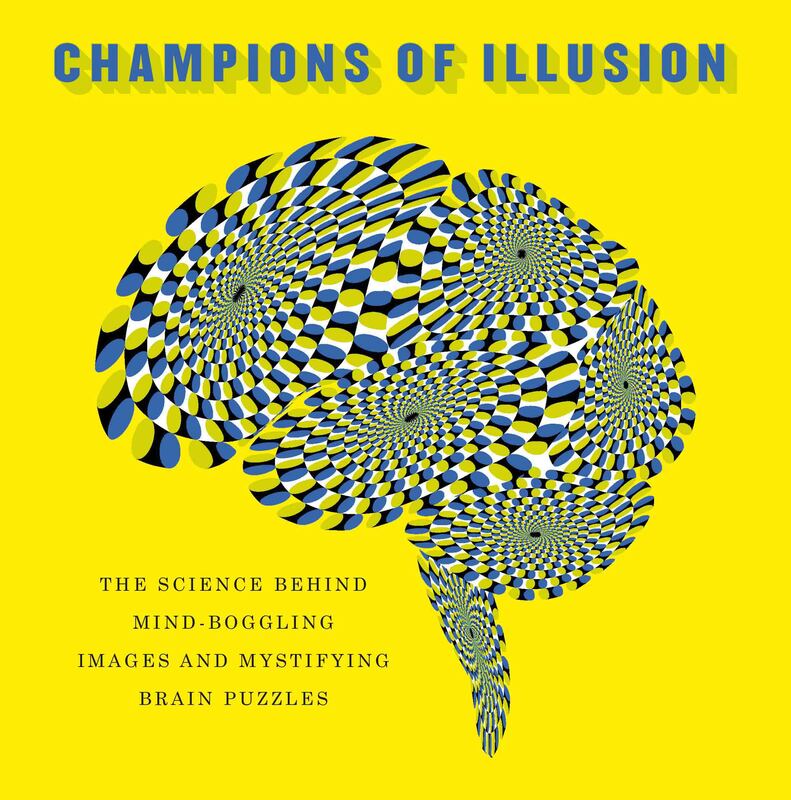 Daniel Simons’s presentation of “The Monkey Business Illusion” at the Best Illusion of the Year contest in 2010. He gave the presentation while wearing a gorilla suit. 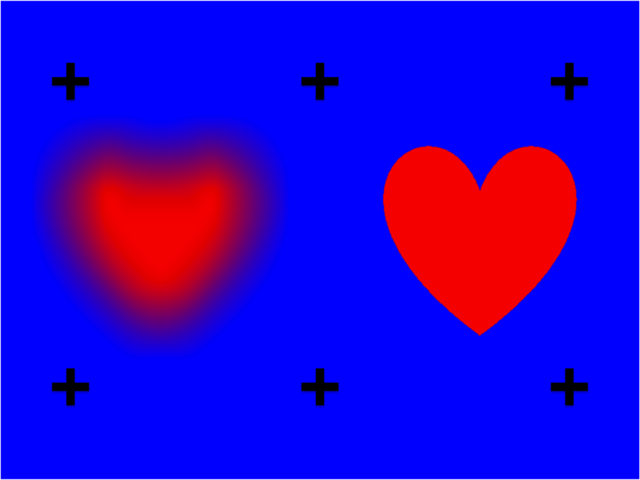 Please move the eyes over the static red hearts on the blue background. The blurry heart wobbles whereas the sharp heart remains still. Fixate the colored image by looking at the fixation spot for about 60 seconds. Now shift your eyes to the fixation spot surrounded by rectangular outlines. If you attend to the vertical outline rectangle you will see the afterimage corresponding to it, and if you attend to the horizontal outline rectangle you will see the different afterimage corresponding to it. You can shift which afterimage you experience by attending to one rectangle and then the other. The movie shows a Brownian surface (which has a fractal structure, but this does not seem to be important for the illusion). The appearance seems to change between matte and glossy, as the ruler illustrates. However, the surface is continuously rendered with matte (Lambertian) reflectance. What is happening is that the height of the surface is stretched in the viewing direction. The illumination direction is transformed together with the stretching to keep the cast shadows constant. This combined transformation of the light and surface height results in an illusory gloss. We initially though that the effect could be attributed to a luminance histogram skew transformation, but this seems not the case. A simple version of the current explanation is that stretching a surface together with the light direction (the so-called Bas-Relief transformation), induces illusory highlights due to darkening at points where the surface normal points away from the optical axis.